This was an exciting read. Whether you are a regular watcher of the Food Network and read every cooking-related book available, or whether your experience is limited to episodes of Hell’s Kitchen (that’s me), you should read this book. They weren’t kidding when they say “immersive” and “adrenaline-fueled” in the book’s description. Michael Gibney tells of his experience in the kitchen through a second-person narrative. 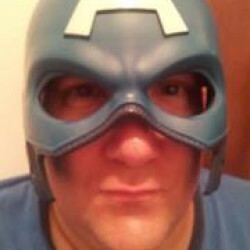 When he speaks about putting on his custom uniform and opening his specialized utensil kit, he’s talking about YOU. 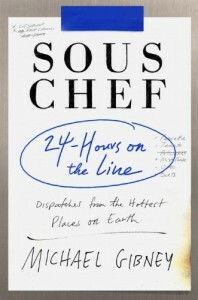 By the time I finished this book, I genuinely felt like I was a sous chef. I was literally sweeping and mopping my floors; I was preparing all the spices; I was making plates look perfect. It sunk in—it became a part of me. I believe three letters separate Gibney’s book from others in this genre: M, F, and A. His advanced degree in non-fiction writing from Columbia pays off in this book. Beside the delicious recipes, Gibney mixes in his flavor of equally delicious words, such as “ruminatively”, “recalcitrance”, and “Promethean”. It all mixes and flows well so that the pages come alive. A true story is told. There are a few nitpicks. The first one is about the chapter that introduces all the positions and the people’s names; it was too much at once. The people that he (I) work with in the kitchen are mentioned more paced out in later chapters, but my brain couldn’t process the whole group at once. Another nitpick would be the translation on some of the foreign banter spoken in the kitchen. It sounds like there is a lot of kidding and fighting going on, but I’m not sure what is said (without pulling up an online translator). And finally, the last few chapters were kind of a letdown after the pacing of the kitchen. I know this is about 24 hours in the life of a sous chef, but after 15 hours in the kitchen, going out for drinks and going home felt anti-climactic. Bottom line: this is a great book that makes you feel like you are part of the line. It is professionally done, well developed, and unlike other books you may have read in the same genre. Thank you to Random House and Ballantine Books for providing me with an electronic advanced review copy.